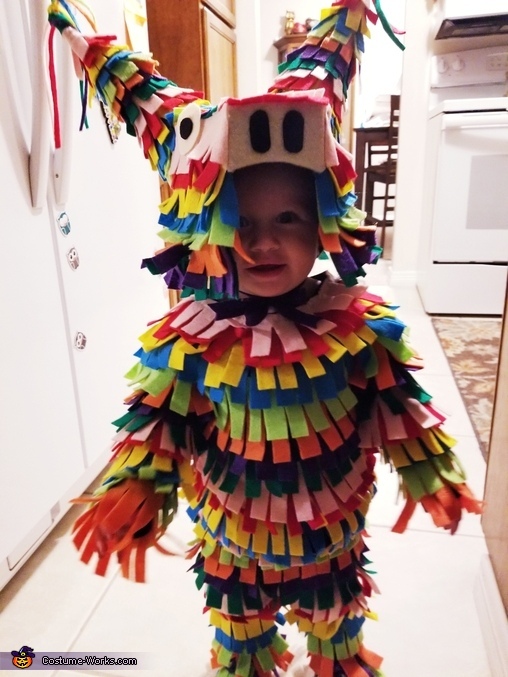 My daughter, Briclyn (Brice-lyn), 1 yrs old, is sporting a warm and colorful piñata costume. The idea came from Pinterest. I had purchased a long sleeve shirt and pants super cheap from Target. Bought a yard in a half of each color of felt. I know have enough felt for 8 years worth of Halloween costumes. I would only suggest a half yard of each color if you are going to make this costume yourself. I cut the fabric into strips and then cut slits in all of the strips (it makes it easier to glue on to the shirt/pants). Then I hot glued all the strips onto the costume starting from the top going down. For the hat I cut foam into 7 pieces; 2 sides; back; snout; top; 2 horns/cones . The top one into the shape of a "bottle" then I glued the sides and back and snout on. I glued the 2 horns into the shape I wanted and covered them with felt then I covered the hat with felt added the horns to the hat. I added two strings of felt to tie under the chin. For the shoes, I just covered a pair of shoes with felt.